The reality is quite clear; we as citizens of this great country have allowed the killing of women, children and innocent Iraqi men all in the name of freedom and liberty. The war in Iraq has been perpetrated on the Iraqi people as the result of criminal fraud and not for our security or to bring democracy and freedom to the Iraqi people. This war is about the control of energy reserves and it is time we hold our elected officials accountable for their criminal acts. We are killing the citizens of a whole country! This war should be a wake up call to all good people of the world. Now is the time to reject the art of war for the brotherhood of man. This war must end and we must turn from perpetual war to a moral, sustainable model that values life and not death. The wealthy super elite are the only people who gain with the war doctrine. The good people of the world do not support killing fellow human beings so a self appointed few can consolidate their power and control the innocent people of the world. Wake up America, take responsibility for what is being executed in your name, reject a model that kills and embrace a model that supports life! The criminalization of our government is beyond most peoples understanding and has permeated all branches and all levels on a massive scale. 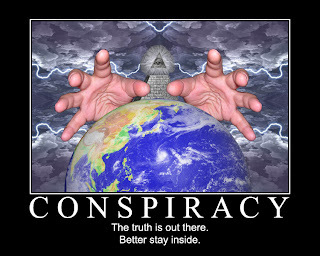 It is not a conspiracy theory but rather a conspiracy truth. When the evidence is overwhelming and continues to accelerate then we have crossed the Rubicon and now find ourselves over the edge and into a period of time that forces us to take action. Now is the time for good citizens to stand up and hold our government accountable for 911, the fraud in the lead up to the war in Iraq, the illegal subversion of our United States Constitution, i.e. the Patriot Act (passed by a weak and self serving congress), the theft of trillions from the Pentagon and the bailout of the Investment Banks on Wall Street. It is time for America to wake up and take responsibility for the situation we now find ourselves. We have allowed the criminalization of our government and failed to protect our constitutional republic from a criminal organization with a goal to establish a New World Order. This new order is based not on our constitutional system but rather on a one world government run for the benefit of the wealthy super elite. It is based on the feudal system where 2% of 2% own and control the land, businesses, i.e. Energy, Petro-Chemical, Food, Communication, Media, Transportation, Production, and Weapons both Land, Sea, Air and Space. This criminal organization does not have the best interests of humanity as part of their business plan. In truth they have become very cocky and now make their moves in plain sight for all to see. We study history so we don't repeat the sins of the past and in the process shoot ourselves in the foot. Many of the sins of our fathers follow us from one generation to the next. I see many of these same sins being repeated in Iraq and Afghanistan and it is our responsibility to guard against these same abuses so we break the cycle of destruction. "...This documentary reveals Canada's darkest secret - the deliberate extermination of indigenous (Native American) peoples and the theft of their land under the guise of religion. This never before told history as seen through the eyes of this former minister (Kevin Annett) who blew the whistle on his own church, after he learned of thousands of murders in its Indian Residential Schools..."
Michael Tsarion has a great understanding and encourages all of us to let go, become lighter and soar like a hot air balloon. I encourage you to listen and lighten the load. The key to being a conscious creator is understanding the power one posses, and then acting on that power. The metaphor of writing, directing, producing, acting and ultimately critiquing our human drama is made manifest if we take responsibility for our life experience. If we never own up to our power then we will never exercise it and instead we will fail and others will manipulate our expression. I wrote this and posted it about a month ago but thought it was worth re-posting for added benefit. I was visiting my parents this past week and my work, researching, writing, websites, books and such became a hot topic of the conversation. They fundamentally are well intentioned and good people and yet they can't seem to wrap themselves around many of my concerns concerning the 911 false flag Psy/Op, the war in Iraq, my differences with the war doctrine, in general, government involvement with the illegal drug business and John McCain and Sarah Palin and their elitist attitude. I did not go over to visit them with any intention of upsetting their world and in spite of my good intentions that is exactly what I did. How do we express ourselves in such a mixed up world, get our point across, be true to our convictions and still maintain our positive energy, not the easiest thing to do. I have struggled with wanting to resonate positive energy and then when someone like my Dad pushes my buttons and challenges my convictions I basically throw all of it on the table and wonder why good people can be so blind. My wife, Deborah pointed out that we can't force people to see what we see if its not part of their reality. UFOs and Aliens might be something real and yet my folks might not be able to accept an Alien involvement in our world. It is beyond their comfort level and beyond their understanding. Crop circles, Aliens, UFOs, false flag operations, New World Order, North American Union, Amero, frequency transmutation and the changes coming to our world around the 2012 date might be my reality but may never be their reality. It is part of the shift. Some will shift and some will not. It is incumbent on us to let go and not push others if it is not something they are ready to do. Thankfully we are all a work in progress and the last act has not been written.............wish me luck! The Law of One is the universal law of the universe. It speaks to the interconnectedness of the cosmos and the reality of instant communication on a cosmic level. The galactic community is literally connected as one electro-magnetic grid as are each sun, planet, and intelligent life in the universe. We are one interconnected unique aspect of the universal mind (God) and we are (wired) (figuratively) connected as One. Human beings are beings of light energy either vibrating very fast (positive) or slowly (negative). We have a free will choice to pick our polarity and can resonate much faster when we meditate on and experience compassion, love, forgiveness, abundance and the higher energy emotions (feelings). Conversely when we are about criticizing, judgment, lack, greed, meanness, lust, we resonate very slowly and align with a negative polarity. Both of these affect the earth grid electro-magnetically and hold a charge within our planetary system. The power-elite are quite skilled in holding our earth with a negative charge. When we are held with a negative charge it keeps our lights (human light) out and dis-connects us from the galactic community. The time for the unveiling is now......those souls who can meditate (daily) on love and compassion will help awaken others, speed up the vibration and in the process help turn the lights back on. Our earth grid needs to be charged with positive energy and over-come the false manipulation that has held all of humanity back. Its really not that complicated once we understand that we live in an electric universe and there has been a short in the system. Spread the word to DYOR enlighten yourself to the truth, empower yourself and others so we can rejoin the galactic community of nations aligned with the light. How many of us have known something very sinister is going on but we just can't put our finger on it? I suspect many of us.......Now is the time to uncover the truth and move past the deception to a brighter day. It helps us understand when we can look back to past manipulations and how our forefathers navigated through to create a better world. We too must learn from our mistakes and not lose sight of the new day coming to our world. I love the biblical narrative and the lessons we may learn from reading our sacred texts, our holy books, and our Christian Bible (66 books in all put together imperfectly by the Council of Nicaea as a volume) to help us understand who we are, where we came from and where we are going. The sacred texts are a way to help us discern who we are as people and who has walked before us. Now it is our turn to carry on the great work of the ages and advance our human species to heights yet imagined. We are in a time where it is important to pay attention and DYOR (do your own research) . Naomi Klein speaks to the truth concerning how the elite few manipulate the good citizens of this Great Nation. We must be eternally vigilant in our responsibilities as United States citizens and hold these people accountable for their sinister misdeeds. After 911 the evil few manipulated all of us with the Shock Doctrine ramming through the Patriot Act while we were still reeling from the False Flag Operation perpetrated on us. They utilized the same technique after the credit markets froze up and pushed through the Wall Street Bailout. Now we must guard against the next manipulation soon to be unleashed against us with the manipulated economic collapse soon to be upon us. Watch and be vigilant when they demonetize the US Dollar and usher in the North American Union and the new currency, the Amero. When we inform ourselves we empower ourselves! We are in the last few weeks of the election and it is important to understand that John McCain is not stable enough to be President during this critical time in our nations history. We have crossed the Rubicon into unchartered territory and the last thing we need at this juncture is an angry man who has a proven history of losing his cool. Watch this Video! In the face of economic hardship we have the seed for real change and an opportunity to transcend the current manipulation. Now is the time to dig deep and rise above the fear factor. It comes down to a choice; either fear or inspiration. When we take the high road we allow very fast energy to quicken our reality and change our world for the better. When we allow fear to infect our lives we resonate very slow unhealthy energy that keeps us trapped in our own negative thinking. We are in the process of a complete economic collapse that is being engineered by a small elite few in the furtherance of their long standing agenda to take our sovereignty both personal and collective. They are quite skilled in their ability to socially engineer a New World Order out of economic chaos. The challenge we have before us is quite simple; i.e. we either allow their evil scheme to take our peace and scare us or we rise above the false manipulation and collectively say no. No to fear and yes to inspiration. The banks, insurance companies, large and small businesses, state governments will seek a bailout from the federal government and the congress will take the bait. In the end even our federal government will be insolvent and our dollar will collapse. When the federal government is tapped out where do they turn? In truth the international bankers know exactly what they are doing and it is a complete financial meltdown so they can institute their New World Order fix, i.e. a new financial system based on a new currency, the Amero. The world is being cut up into zones, the North American Union which includes the United States, Canada and Mexico, the European Union, Asian Union and the African Union. It is important that we know what is going on and that we stay calm in spite of the chaos going on around us. What a great time, to be here, experiencing life in the earth plane. As we experience the breakdown of the established order we need to be cognizant of the fact that all is well and moving towards a new horizon. I liken it to birthing a new baby. What a joyful time to be "expecting". When we experience pregnancy we know during the final month, before the birth process actually starts, it becomes very uncomfortable and there is great expectation for what is coming, not only the birth process itself but the joy of a new baby. As the mother begins the birth process time speeds up and many unknowns present themselves. It can become quite traumatic, painful, scary, bloody, and even in some unfortunate cases deadly. One must be about their wits and not allow the process to take ones peace but rather stay focused on the release and the new life being birthed. We are in the beginning stages of the birth process and now (more than ever) we must dig deep and keep our eyes focused on the new life and the joy associated with it. Many will run to and fro doing their best to frighten the un-knowledgeable about what is happening, economic collapse due to the sub prime mortgage meltdown, Wall Street credit crunch, the derivatives and futures markets and the simple fact that most people in north America are fooling themselves as to the extent of the problem. Have no Fear! As we experience the system breaking down let us be cool in the eye of the storm and not be focused on the birth process but rather the new life, a new civilization being birth. The old must pass away for the new to be born. It is actually a time of great joy! Be supportive, be helpful, be strong, be clear headed, be prepared, be positive, be a true partner and friend and when all is said and done be joyful and lift your hearts with great thanksgiving for what is to come! And.......be at peace. May our light shine in the midst of the dark and illuminate our surroundings.